Takeaway: The disadvantages of many two-package epoxy coatings are eliminated by new single-package coatings that perform comparable to that of standard two-component epoxy coatings even for challenging applications such as the decks and superstructures of ocean-going ships. Epoxy coatings are commonly used in the protective and marine coatings markets because of their versatility and excellent corrosion resistance properties. Unfortunately, separate packaging for the epoxy resins and the amide or amine hardeners is required; otherwise the two components will chemically react and result in a negligible short pot life if mixed prematurely. The single-pack epoxy coatings that do exist are not as strong or are impractical for most protective and marine coating applications because they require a bake cure. 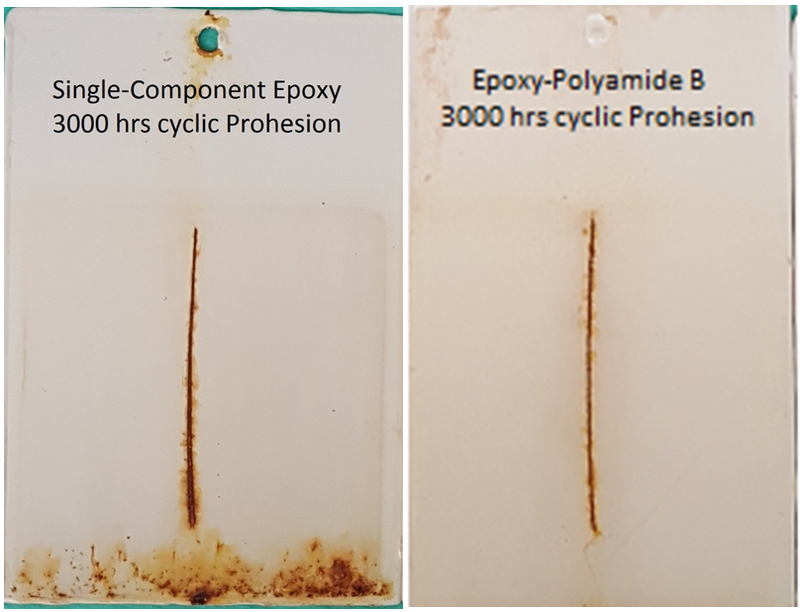 This article will describe the features and benefits of a new epoxy coating technology that allows for true epoxy-amine curing in a single-pack product. The performance, convenience benefits and environmental considerations of the new epoxy coating technology versus the traditional two-component epoxy products will be examined. Until around the 1950’s, the vast majority of single-package coatings used for substrate protection provided excellent water, chemical and corrosion resistance, but they had a very high solvent content, which required several coats to obtain the target dry film thicknesses (DFT), and contained a large proportion of hazardous volatile organic compounds (VOCs). Due to regulations introduced in the mid-1970s in the United States, these coatings fell out of favor and were replaced by two-package epoxy coatings. The two-package epoxy coatings have some disadvantages. The ingredients must be kept separate until immediately before the coating application begins. And although the ingredients are premeasured for complete use, attempting to mix only a fraction for a small job is problematic without accurate measuring or weighing equipment in the field, with the attendant opportunity for wastage and loss. Finally, it has been difficult to produce one-package low VOC epoxy coatings because they are susceptible to water entering the manufacturing process and thus shortening the shelf life of the coating. These disadvantages are eliminated by a new single-package coating that performs comparable to that of standard two-component epoxy coatings even for challenging applications such as the decks and superstructures of ocean-going ships. This new technology, which is the subject of this article, has resolved the problem of limited stability and inordinately short shelf life. Sets of cold-rolled steel panels of various sizes were used to evaluate corrosion resistance. The test panels were abrasively blasted to achieve a desired surface profile. Q-Fog cabinets were used for the laboratory testing. The steel test panels were coated, allowed to dry (cure) for 7 days, scribed with an X-scribe or 2-inch vertical scribe, and subjected to the appropriate test environment prescribed by the test method. At predetermined intervals the test panels were removed from the cabinet and evaluated for blistering and rusting in accordance with ASTM D714 Standard Test Method for Evaluating Degree of Blistering of Paints and ASTM D610 Standard Test Method for Evaluating Degree of Rusting on Painted Steel Surfaces. A summary of the rating scales is shown in Table 1. Table 1. ASTM Rating guide for rust and blistering. After 1000-hour, 2000-hour and 3000-hour exposure intervals per ASTM B117, the test panels were removed and examined for rusting and blistering. Scribe creep measurements were then taken after using a paint stripper to remove the coating. Results are shown in Table 2. All ratings and scribe creep values reported below are the average of the three test panels in each set. Table 2. Salt fog results. 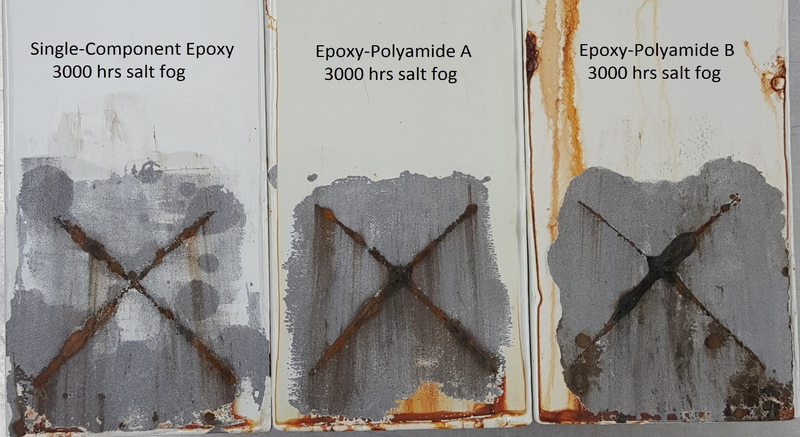 The results and photos of the salt fog exposure panels before (Figure 1) and after stripping (Figure 2) the scribe area indicates that the corrosion resistance of the single-pack epoxy was similar to the two epoxy-polyamide coating control, with no observable field rusting or blistering. The scribe creep was also comparable to that of the controls. Figure 1. 3000-hour salt fog panels, before stripping. Figure 2. 3000-hour salt fog panels, after stripping. As with the salt fog testing, for each product under evaluation, three sets, each comprised of three panels, were exposed to Cyclic Salt Fog/UV Exposure per ASTM D5894. Results for the 1500-hour (roughly 4.5 cycles) and 3000-hour (roughly 9 cycles) exposure intervals are shown in Table 3. Table 3. Prohesion test results. 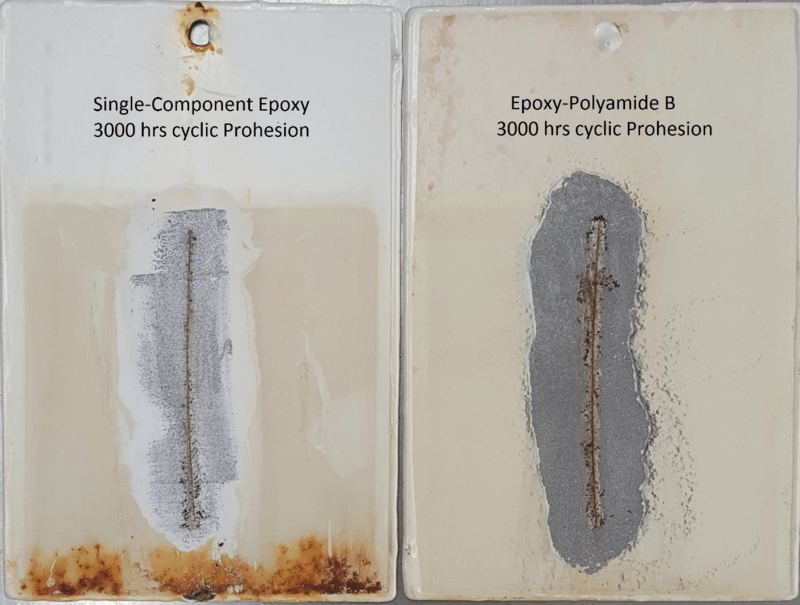 Again, the results indicate that the corrosion resistance of the single-pack epoxy was similar to the two epoxy-polyamide coating control, with no observable field rusting or blistering. The scribe creep was also comparable to that of the controls. Photos of the cyclic Prohesion exposure panels before (Figure 3) and after stripping (Figure 4) the scribe area are shown below. Figure 3 – 3000-hours cyclic Prohesion, before stripping. Figure 4. 3000 hours cyclic Prohesion, after stripping. A damaged coating surface is an ingress point for water, oxygen and corrosive chemicals. Therefore, the three coatings were evaluated to ascertain their physical properties of abrasion resistance, film hardness development, impact resistance, adhesion and stability, all of which contribute to the coating’s ability to resist corrosion and extend its service life. Abrasion resistance. ASTM D 4060 Abrasion Resistance of Organic Coatings by the Taber Abraser is a common method used to evaluate the abrasion resistance of organic coatings. Abrasion resistance is calculated as the loss in weight after the surface is abraded a prescribed number times. 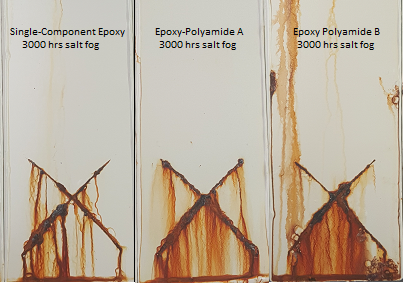 Results for the single-pack epoxy are compared to the same two commercially available polyamide epoxies. Table 5. Abrasion resistance test results. The abrasion resistance of the single-pack epoxy is comparable, falling between the results from the two-pack epoxy polyamide coatings. Film hardness development. ASTM D 4366 Hardness of Organic Coatings by Pendulum Damping Tests is a common method used to evaluate the film hardness of organic coatings. Pendulum hardness over time of the single-pack epoxy and epoxy-polyamide A was compared. Both coatings showed similar hardness development (Figure 5). Figure 5. Pendulum hardness test results. Impact resistance. As previously mentioned, a damaged coating is a pathway to the initiation of corrosion. The places where protective and marine coatings tend to be used often contain many opportunities for accidental damage, so the ability to resist impacts contributes to the coating's overall effectiveness. As seen in Table 6 below, the impact resistance of the single-pack epoxy coating is comparable to the control products. Table 6. Impact test results. Adhesion. The performance properties of the single-component epoxy were compared to the two commercial epoxy-polyamide controls per ASTM D4541 Pull-Off Strength of Coatings Using Portable Adhesion Testers. Similar results were observed for all three products (Table 7). Table 7. Adhesion test results. Stability. To test the stability of the new single-component epoxy coating, samples were placed in an oven to accelerate the effects of aging at room temperature. The results are shown below (Table 8). Table 8. Viscosity increase with aging at 120°F. Although some viscosity increase over time was observed when the samples were exposed to elevated temperatures, the viscosity of the new single-pack epoxy exhibited stability in excess of one year, which is deemed to be a sufficient shelf life for coatings of this type. Some other properties of the new single-pack epoxy and the two-component epoxy coatings are shown below (Table 9). Table 9. Typical properties for the three products. The convenience of single-component coatings offers advantages over multi-component coatings. The difficulties inherent in determining mixing ratios are eliminated, as are the restrictions on pot life. A new single-pack epoxy coating provides a reasonable shelf life with a high level of corrosion resistance on par with that of commercially available two-component epoxy polyamide coatings. Beyond corrosion resistance, the physical properties of the new low VOC single-pack epoxy coating are similar to two-component epoxy polyamide coatings.